Grenade Killa Coffee Skinny Latte is made using only the finest Arabica Beans and milk fortified protein from grass fed cattle, and is infused with fresh milk, for that smooth, silky, refreshing, Latte Iced Coffee taste! Also providing a natural hit of 150mg of caffeine, delivering both energy and alertness and 23g of complete protein (and only 99 calories!) per can, to support lean muscle growth. You must be 16 years or older to purchase this product. 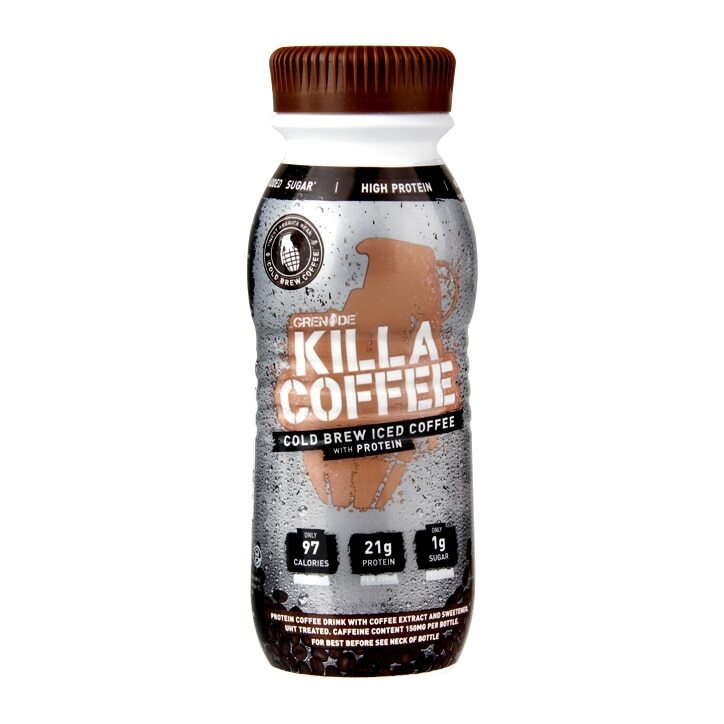 Killa Coffee can be consumed at anytime of the day and is best served iced cold. Shake well and enjoy. Water, Milk Protein, Coffee Extract (1.5%) Sweetener; Sucralose, Stabiliser; Carregeenan, Socium Carbonate. Unopened, Killa coffee can be stored at room temperature, once opened store chilled and consume within 12 hours. For best before see base of can. Heat treated. Grenade Killa Coffee Skinny Latte is rated 3.1 out of 5 by 8. Rated 1 out of 5 by GymGoer1 from Lump protein mess at the bottom! The coffee tastes great but with all three bottles I purchased, there was a lumpy mess of protein at the bottom that was impossible to remove! I had to blend the last one in a blender to bind both the coffee and the protein. Don't waste your time or money with these! Rated 1 out of 5 by HeatherWeather from Lumpy Coffee? No Thanks! Bought this a few days ago and, while it tastes great, I was dismayed to find big globby lumps of it at the bottom of the bottle! I had shaken it up a lot before opening it as I know from experience that this type of drink can sometimes settle a bit. However the lumps were still there. Next bottle I shook for over a minute. Still lumpy. This morning I decanted one into a jug and whisked it up. Still lumpy - just smaller lumps! Won’t be buying again - will return to the Pro2Go coffee which is lump free and you don’t need a blender to be able to drink! Rated 5 out of 5 by JUSTJJ from Great tasting coffee! Advised to give this a try from a friend and it was not bad advice at all! Love the taste, and the extra protein is a boost to up my daily intake! Will get again and so should you! Rated 4 out of 5 by Char321 from High protein, low fat and carbs Great tasting drink considering the macros. Super high in protein which virtually no fat or carbs. Great for if you are trying to get your protein intake up.